Word is the One World Observatory, the new World Trade Center atop 1 World Trade Center in Manhattan, isn’t doing great box office. And the New York Times seems to lay the failure at the feet of its tacky management and its high sticker price. But more likely, the problem is that it’s surrounded by ten million or so people who wouldn’t go up there if you paid them. They’re called New Yorkers. 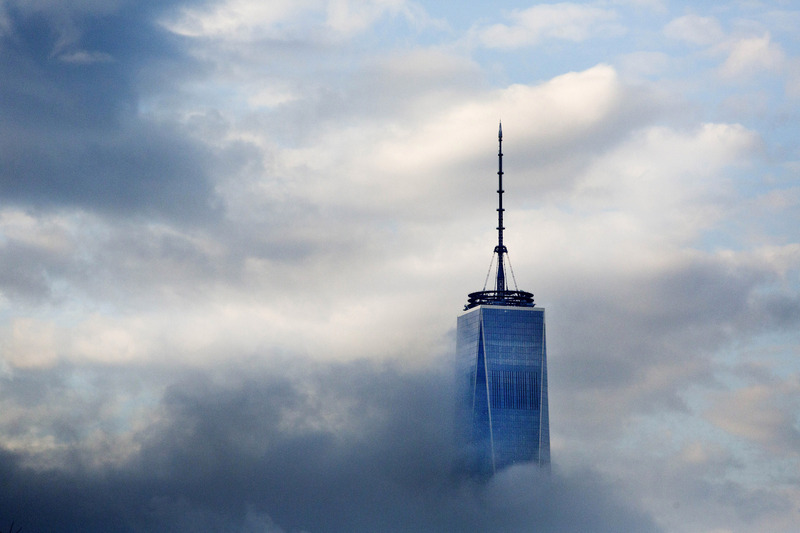 The new World Trade Center is visible from as many places as it’s not. We all have a relationship to it, and, maybe moreso, to its parents. About six months before the attacks, my job took me to a weekday brunch at Windows on the World. I remember nabbing stationary and continental breakfast, and thinking that it sure did offer a comprehensive view of Jersey. On the day of the attacks, I left work in midtown and walked down 5th Avenue toward the pillar of yellow-brown smoke dust, then mustered by City Hall with some like-minded folks, hopped on a commandeered MTA bus through that zero-visibility soup to the West Side Highway, joined a search-and-rescue crew and waited for the go-ahead from the improvised authority, loading boxes of medical supplies and cases of bottled water onto fire trucks until two in the morning. That about sums it up. When they finished the new one, like everyone, I wasn’t that impressed. The old one wasn’t so special—it looked more like a logo embroidered on a golf shirt than an edifice of note. And the new one, with its crown of thorns and its look-how-tall-I-am radio tower, is even less distinguished. Like everyone with a memory of the attacks, I had zero interest in visiting that once-and-future abattoir in the sky. But like everyone with a memory of the attacks, it kept popping up in thoughts that were supposed to be about other things. It was that ever-more idiosyncratic echo that drew me up. The Times bemoans the $32 price tag. But that’s about what it costs to see 3-D superheroes talk a lot of rot over a soda and Sno-Caps in Union Square. Like a rube, I paid upward of fifty dollars to dodge the lines. There were no lines. So I scurried down into the basement of the new WTC with a deepening sense of the quarter mile of steel, concrete, and glass above me. I wended down an empty tens-a-barrier maze, through the airport security and into some AV hooey about the steelworking humps who built the thing, just tedious enough to salve the nerves. That gave way to a cave of stupidly fake stone. This is where I got the sense of being worked on to some very definite effect. The phony cave is clearly there to remind the visitor of the exceedingly firm stuff that Manhattan Schist is, and to draw your attention away from the other, more likely reasons that you may well be buried alive in a historic heap of mixed-use real estate. The cave is also dark and a little narrow, to weed out the panic-attack types early on. The logic of a slaughterhouse says you ought to keep the animals calm. That brings us to the next phase of our journey—and probably the most widely lauded part of the whole experience. It’s basically an elevator with floor-to-ceiling flat-screen TVs on its walls. The TVs show New York from its days as a low-rent primordial swamp through its era as a hip hunting ground for the Lenape, its port career for the Dutch, English, and Americans. They left a few things out, as did I, but you get the idea. As you near the top, girders clang into place around you. The elevator is impressively fast, leaving you off at 1,242 feet, or about 110 feet lower than the Willis Tower Observation Deck in Chicago. A little wobbly in the legs, I followed my fellow rubberneckers from Bangalore, Bologna, and Sheboygan down a flight of stairs to a selfie-stick pit where someone in uniform repeated a shtick about renting an iPad so you can tell CitiCorp Center from the MetLife Building. Mostly people got them for their bored kids. After more corralling past the dining options, I went down another flight of stairs. There was some jive about a porthole where you could look all the way down to street level. But it was just more TVs, this time in the floor. The marketing mantra of the Observation Deck is “See Forever,” just the kind of pablum meant to thread the needle and dodge both memory and meaning, in favor of something akin to the thrill one gets in an IMAX. And you can see for a ways. I did a slow meander around the Observation Deck. Midtown and Lower East Side, to Wall Street and Brooklyn, to the Harbor, Coney, the Rockaways and Sandy Hook, to Jersey, Jersey, more Jersey, then the Hudson, George Washington Bridge, midtown, uptown and the Bronx, all the way up to the Mariotts of (I think) Stamford in the far distance. I did one circuit, then another, a little faster. Seeing forever didn’t quell my agitation. It was hard not to think about flames and smoke, to imagine the feeling of being hopelessly far from the street below, and then to feel all the dimensions of the room you’re in give way at once, and for what—to hold down a job, to look out over the Hudson? It wasn’t a good death. I watched the planes banking northeast out of Newark, or crossing midtown on their way into LaGuardia, as if my vigilance would do a damn thing for me or for anyone. Tourists ambled past, clustered for shots with the upward sprawl of midtown behind them, collected images in their iPads to save them the trouble of looking. “See Forever,” indeed. “It’s easy to see without looking too far that not much is really sacred,” as Bob Dylan said, would be better tagline. I needed a drink. I sidled up to the bar among what seemed the sort of people who would not only dance on my grave, but pay for the privilege. The whole thing boggled my mind in a bad way. I ordered a Manhattan—eighteen bucks and sure to be twenty two once the Euro bounces back. Maybe my mind’s been warped by America. “Go big or go home” is something we say here, even in New York, loud and with a straight face. The clean cut lads in Murray Hill say it about their golf clubs, the cold-blooded gents checking the Metro-North schedule say it about the CDOs they’re packaging, the small businessmen in Queens say it when selling or buying car speakers, the young women with British accents say it to oligarchs when selling condominiums overlooking the High Line, McDonalds says it. After the attacks, that same impulse led us to a few wars that didn’t work out like we’d hoped. So why couldn’t we build something more impressive? They say it’s the tallest building—well, not in the world, but in the Western Hemisphere—well, yeah, if you count the radio tower—well, yeah you shouldn’t, really, but… We all know a lie when we see the fine print. But they couldn’t leave the ground alone either. I realize people had money invested. But if there was ever a time for a minor jubilee, to forgive some small handful of debts or leases in the name of a common humanity, a time when there was a shared spiritual need for an aesthetic gesture to reflect and to respect the dead, it was the attacks. They could have made it a park, or as Exemplary New Yorker Speed Levitch once suggested, a small meadow where buffalo would graze. But, as the last 15 years have shown in New York, rudimentary aesthetics and common humanity are in terrifyingly short supply in the real estate trade. My point is that, with our blood up, and all kinds of trumpets blowing in our ears, we neither went big, nor did we go home. Rather, we counted the federal funds, guesstimated the rents, and put up a tallish glass barn. The resulting structure is a monument to no one caring about anything but making a buck. It’s a weak, real-estate scheme that forces a few thousand of hard-working schmucks to paint a target on their backs five days a week just to try to get ahead. At best, the new tower is the kind of unimpressive compromise that allows a mercantile, democratic society to muddle through the best and worst of times without painting the streets entirely red in its own blood. I had more than one drink. The sun sank over the New Jersey Turnpike. People ordered wine, picked at french fries and entrees. Kids scanned the skyline with their rented iPads, bored, running out the clock until they could go back to the hotel and look at their own iPads. This wasn’t the “Never Forget” crowd. The sense of being the only one in OneDine who gave a damn about the attacks, about any of it, dogged me. There were adults in the restaurant. They remembered, in some way. But they didn’t care, and that was a kind of amnesia. Some Brits sat next to me. A pair of them lived outside of London, and the others lived in Jersey City. We talked about Jersey City and about September eleventh. It was a candid and sincere chat among strangers. Along with the drinks, it brought me back from jeremiad-country. I paid my bill. Feeling magnanimous and a little sorry for the waitstaff who worked so far from the earth every day, I threw a proper tip on top of the 18% they tack on. By then Broadway shows and tired children had thinned the crowd on the observation. The sun kept sinking, blotting out Jersey. I looked again, up through the village, Chelsea and Midtown. I recognized the buildings where I’d worked, pursued this and that, gotten into or out of trouble. It left me with a sense of a life spent into something that showed me back to myself. And with the music swelling, or at least he pressure of my own intransigence lifting, that sense of reflection deepened into something else. There’s a theory in physics, maybe not the most popular one. Some physicist noticed that electrons, unlike every subatomic particle, are all eerily identical. And he said maybe that’s because there’s only one electron, and it exists outside of time, and runs through everything, keeping all the atoms tied together, like a short order cook refilling every one’s coffee and keeping the bacon from burning throughout the whole universe. And looking down on all those places, from the jetty tip of Breezy Point to the West Side Pier with the Lincoln Tunnel air vent, to the Hell’s Gate railroad bridge, all these places I’d been, I had that sense of being just such an electron, with my life running in a majestic course all at once in this city. So yeah, maybe it is worth the thirty bucks. Colin Dodds grew up in Massachusetts and completed his education in New York City. He’s the author of several novels, including WINDFALL and The Last Bad Job, which the late Norman Mailer touted as showing “something that very few writers have; a species of inner talent that owes very little to other people.” Dodds’ screenplay, Refreshment, was named a semi-finalist in the 2010 American Zoetrope Contest. His poetry has appeared in more than a hundred eighty publications, and has been nominated for the Pushcart Prize. The poet and songwriter David Berman (Silver Jews, Actual Air) said of Dodds’ work: “These are very good poems. For moments I could even feel the old feelings when I read them.” Colin lives in Brooklyn, New York, with his wife Samantha. You can find more of his work at thecolindodds.com.